Happy Memorial Day Weekend! First order of business, an apology. Turns blogging is like flossing – you really need to do it regularly to reap all the benefits. (Reminds me – I should really floss more). Anyway, it has been a while, but I’m so excited to be back! To ease myself in, this will be a non-traditional post. Don’t worry, I’m currently amassing a nice array of posts about actually dining out, but for now, I’m making a fuss about my new best friend: a weekly CSA! My friend Michelle and I decided to go halfsies on a weekly CSA program from Smucker Farms of Lancaster County. 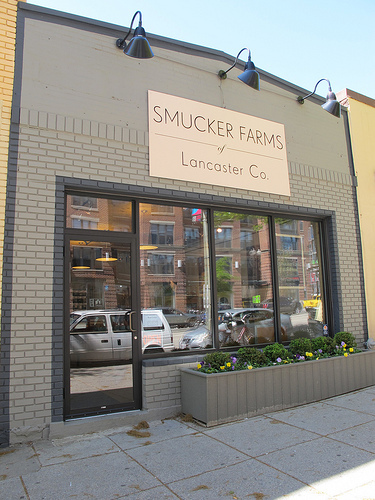 The Smucker CSA is so fabulous because it brings together many different Amish and Mennonite farms working cooperatively. Although our CSA is only fruit and veggies, we can always pick up meats, cheeses, and other local items (like Gordy’s Pickles and chocolate chip cookies from Blind Dog Cafe) from their store on 14th street, which serves as the pickup spot. From now until November, we’ll pick up a box every Friday, and halve the bounty for the week! The price is right, as is the convenience factor (I love when other people shop for me! ), but more than anything, we’re very excited about the thrill of new ingredients which we would never pick out ourselves. (I’m looking at you, bok choy!) So far we’ve been inundated with greens, but as the summer progresses, we’ll have a much bigger variety. So, without further ado, a week of CSA meals! Obviously not too much effort went into this meal, but it was delicious all the same! 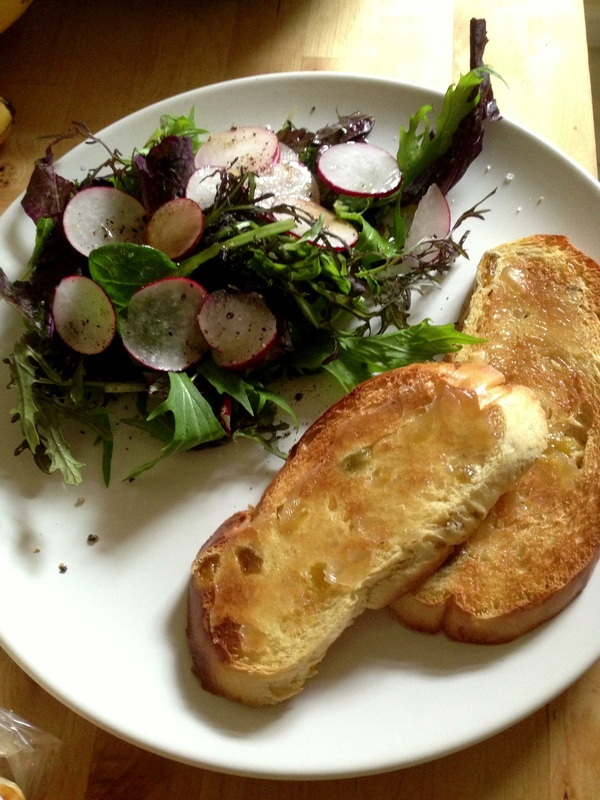 Mixed green salad with radishes and scallions, with raisin challah toast! 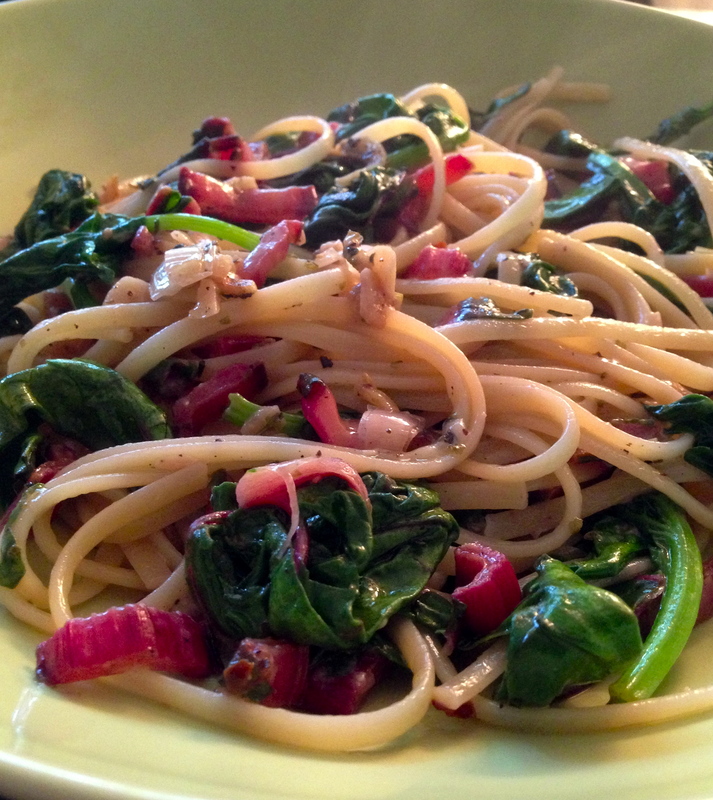 Absolutely gorgeous swiss chard (with stalk) sauteed with lots of garlic and scallions with a simple olive oil and pecorino romano sauce over linguine. 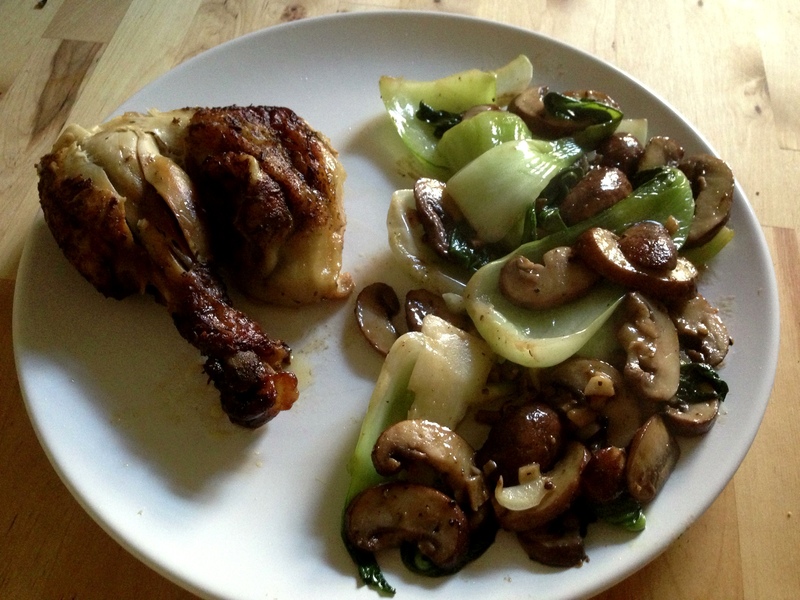 Got over my fears of bok choy and sauteed it up with mushrooms, ginger and garlic in olive oil and butter. Add a roasted chicken thigh for some protein, and you’ve got the quintessential “comfort food” meal. 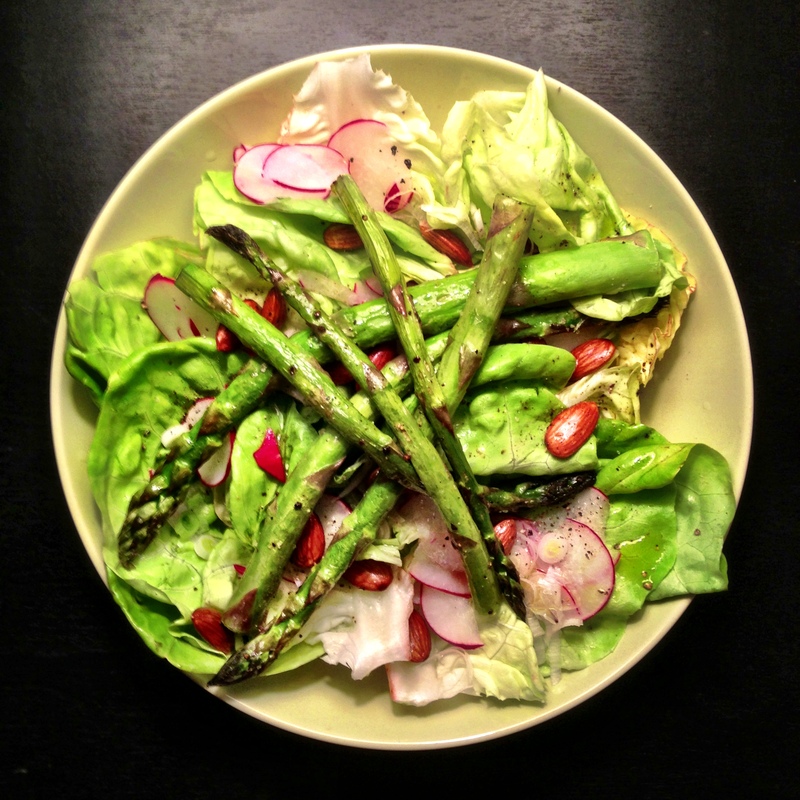 Finally, a luscious bibb lettuce salad with radishes, almonds, scallions, and roasted asparagus, and tossed with lemon juice, olive oil and a liberal dash of salt and pepper! I’ll be back soon with a post about dining out in DC! Now, go floss, everyone! 12 Screaming babies, 11 awkward pat-downs, 10 long delays, 9…okay okay, you get the idea. Traveling at the holidays isn’t exactly fun. Mechanical failures and belligerent passengers seem to be relentless fixtures of my travel experience, but I soldier on as best I can. For Christmas, it’s the white snow and frigid temperatures of Madison, WI that I return to. And although I’ve only lived in DC for two and a half years, my stalwart Midwestern endurance of cold has utterly vanished. It was COLD. Luckily, most of our activities were inside (after successfully convincing my mother to turn up the heat to…wait for it…a balmy 68 degrees), and involved a lot of baking and cooking. There were two big meals to prepare for, and although it was only my brother, my mom and myself, we went all out! My brother, as usual, was the brave leader in our culinary endeavors. For Christmas Eve, it was to be the Feast of Seven Fishes (we only managed five, but that’s beside the point), and for Christmas Day–roast lamb. Christmas Eve went swimmingly (get it – fishes…swimmingly…ha! ), but there was some major drama for the Christmas Day meal. Our brains must have been addled by the meal the night before. But, I think you’ll understand why…. The Feast of the Seven Fishes is a traditional Italian Christmas celebration that generally consists of seven seafood dishes. Dane, in normal fashion, marched into the seafood market with my credit card and emerged with $70 worth of lobster, shrimp, clams, mussels, and monkfish. I admit, I was hesitant about all this fish…give me a nice piece of salmon anyday, but this feast was a real departure from my norm. But I converted quickly. What came next was a beautiful shrimp and lobster platter with homemade cocktail sauce, and a lobster risotto topped with a hefty piece of monkfish and surrounded by a broth of clams and mussels. Delicious! Christmas morning was lovely, with the snow sparkling in the dazzling sun. We had apple muffins, cookies and tea and unwrapped our gifts together. In afternoon, we commenced our preparations for the big meal: roasted lamb with brussels sprout/cauliflower gratin (a repeat from Thanksgiving because it’s so good) and a beautiful salad with pomegranate, pecans, and blue cheese. Since we were roasting the lamb, we had set it on a roasting rack in a glass dish in the oven at a temperature of 425 degrees. About 25 minutes in (and with our brussels sprouts and cauliflower roasting in their own pans), my brother decided to add some broth to the meat. Warning: do not pour cold broth into a glass baking dish in a 425 degree oven. Why, you ask? Because the dish will shatter into a million pieces, that’s why! It’s true folks, the dish verifiably exploded and we were left picking pieces of (tempered – thank goodness, no shards for us) glass out of the oven and the cauliflower for a good 30 minutes. Luckily, no one panicked too much (and we can’t just go out for Chinese, since I can’t actually eat it), and we ended up popping everything back in the oven. Surprisingly, everything was perfectly cooked! Christmas Day always ends with Cassata cake, a Sicilian cake that we’ve made every year since…well…since I started forming memories of eating good food! It was a great spread, and we were delighted to be eating leftovers in various ways for the rest of the visit! I hope everyone had a great holiday season, and are living it it up in 2013! !